The classic strategy game is getting an HD re-release and collectors edition. Last year, during the evacuation of THQ, many IPs were hastily shoved into escape pods for safe keeping. While many were active franchises, others were relics from bygone eras. The pod containing the space strategy classic Homeworld was scooped up by the Gearbox Mothership (which I imagine looks like a large 'G'). Unlike THQ, Gearbox actually wants to do something with the property, but first, it'd like your opinions on how best to go about it with an online survey asking about interest in an HD remake and possible collectors edition. 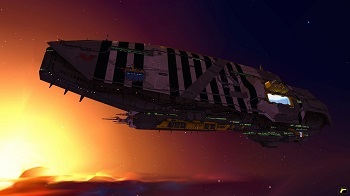 The survey gathers basic demographic information, but also has a fact sheet on a high-def re-release of the classic Homeworld games. It mentions higher-res textures and models, new post-processing effects, music from the original composer, and "animated cutscenes re-created in HD by the original artists". It also mentions integrating Steamworks features like matchmaking, achievements, and user-created mods, likely via Steam Workshop. Basically, imagine everything you'd want in a revamped Homeworld. After that, Gearbox starts asking questions about a potential Collector's Edition. What would you like in a Homeworld HD Collector's Edition: ship models, fold-out map, an art book, concept art, or in-game goodies? I don't buy games in a box often anymore, but I might make an exception if it came with a pewter model of the Kushan Mothership.